Bathrooms are the smallest and most popular area in the home. We all spend plenty of time in there; and if you have children, sometimes it’s the only place to hide for a few minutes of alone time. Sometimes you’re in there just long enough to notice the peeling paint, cracked tile, shabby curtain, and then you wash your hands and it’s forgotten again. Isn’t it time to give the bathroom the attention it deserves? 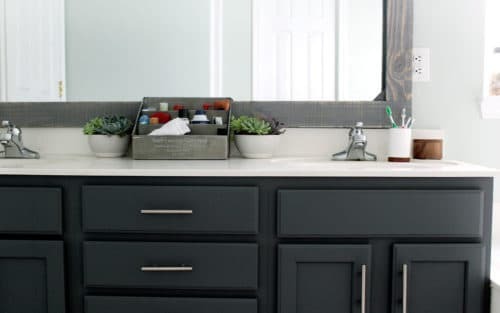 A bathroom makeover doesn’t have to take a lot of time or a giant budget. 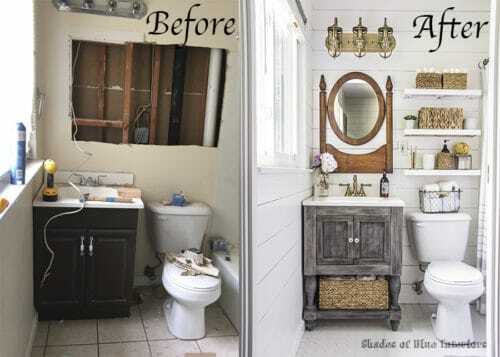 We can show you how to create a beautiful bathroom makeover. In no time at all you’ll be so excited when your guests ask to use the restroom. 1. Use light color palettes. Dark colors tend to make a space look smaller. For the best small bathroom design go as light as possible. Hence the reason why we all love a white bathroom. 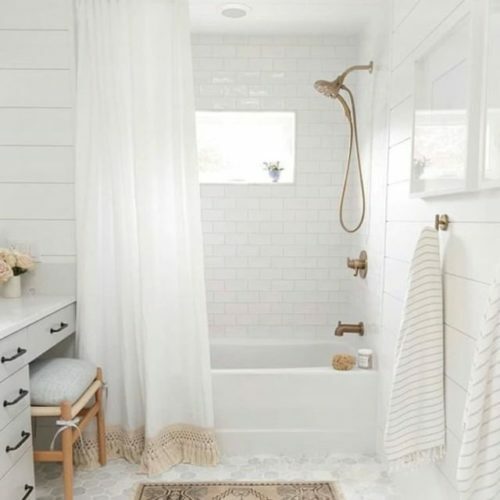 Light colors also give a clean vibe, any who doesn’t want a sparkly clean bathroom? Take colors seriously; and use light tones as much as possible. 2. Keep colors simple. 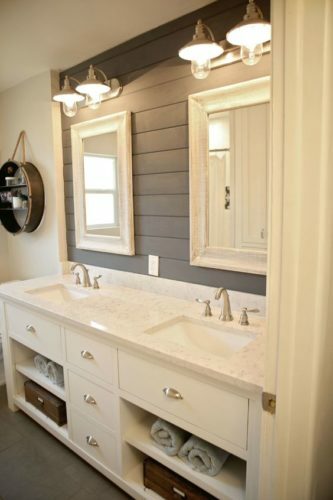 A bathroom doesn’t need a full palette, two or three colors top is plenty. 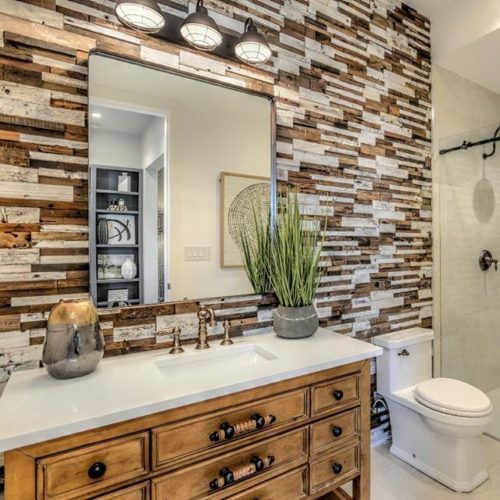 Your palette should connect your bathroom as a whole so that your paint color will unite walls, fittings, floors, and tiles. Don’t apply strong contrasts which can break up the space and make the space look smaller. 4. Emphasize the mirror. Make good use of the basic bathroom elements that are already there. 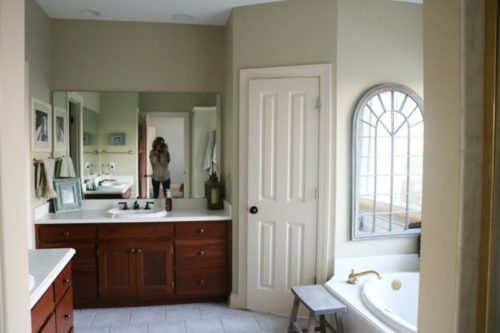 The mirror is a magical tool and a major focal point in any bathroom, so use it wisely. Find a mirror that matches the style of your room. It can be elegant, rustic, modern, or vintage, but make it stand out. You can use additional mirrors against the window in order to reflect light; or opposite each other to obtain the illusion of space. The less natural light you have, the bigger the mirror needs to be. 5. Let in the Light. A dark bathroom is cramped and uninviting. Rather than covering up the window, use a frosting spray or blurred screen to create privacy without sacrificing natural light. The darker a small bathroom is the more cramped and uninviting it will feel. Any light bulbs in bathrooms should be soft light bulbs, without the strong yellow beams created by other bulbs. 6. Show off the shower. 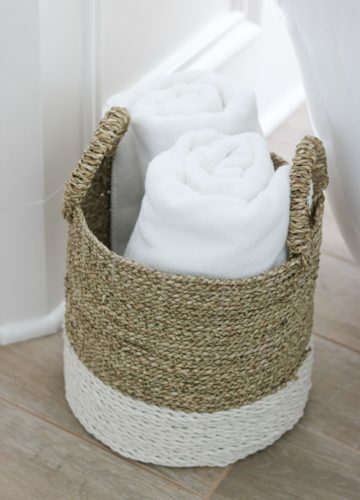 If you have a tiny bathroom with a shower or tub, use clear fabrics or soft curtains. If you create an artificial barrier between their shower/bathtub and the rest of the bathroom it makes the space look even smaller. 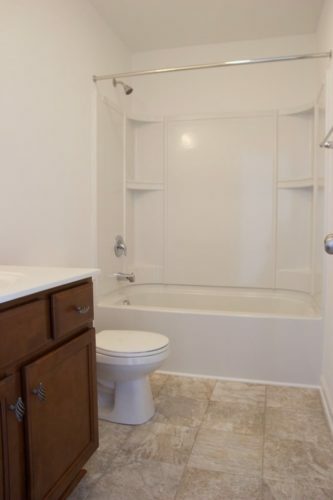 Honestly, sometimes the bathroom just looks old. It might have been great several years ago. Now it’s old and dingy and about as un-beautiful as you can get. Good news – this is easy to fix! A few simple touches can take the outdated back into reality. Paint – This is the best way to instantly update your space. 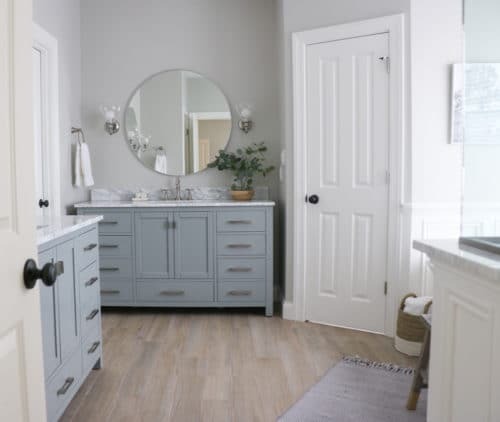 A fresh coat of paint can completely transform the bathroom from old and drab to updated and fab. Go brighter and lighter than you think you should and we guarantee you won’t regret it. 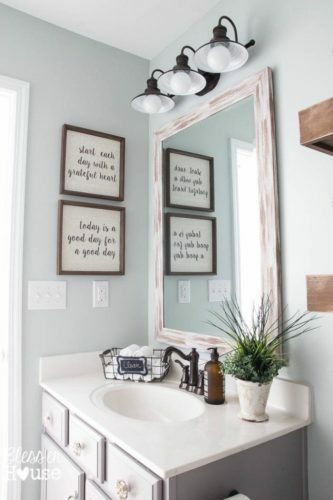 Update the Mirror – Whether you want to frame it yourself, paint an existing frame, or replace it all together make the mirror the focal point. It’s one of the most elegant elements of home décor, and you need one in there anyway, make sure it’s beautiful. 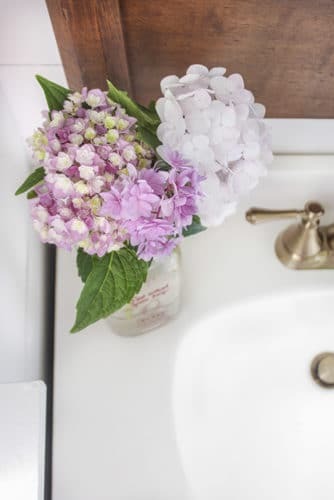 Use Photos – Keep your family memories out of the bathroom, but a few interesting photos can update a bathroom instantly. Choose an antique or farmhouse frame with beautiful prints of places you’ve visited, hobbies, interests, world maps, animals, or any other type of photo you enjoy looking at for approximately 5-7 minutes 3 or 4 times a day. Sometimes a few small changes can make a huge difference. These are easy things you can do in a couple of hours before company arrives to give your bathroom a quick boost. Get rid of clutter. Bathrooms are intolerant to clutter. You don’t have any room for anything necessary so get it out of there. It takes only a few ‘thrown’ items to make them look cramped. Keep the countertops clean. For any small rooms, emptiness is essential. Get creative. 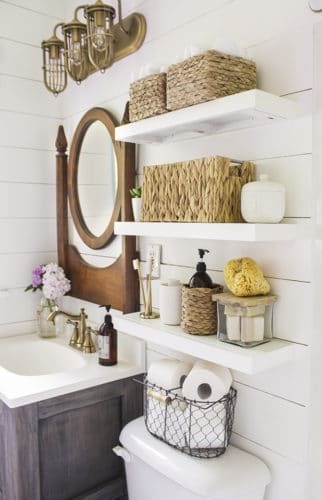 Instead of using classic caboodles for toiletries and cosmetics, store items vertically Floating shelves are affordable and modern and an easy way to create a beautiful bathroom design with plenty of extra storage space. Add something green. A small succulent on the counter, a beautiful lily by the tub. Add some type of greenery to the bathroom to give it light and life and a breath of fresh air. Go beautiful. Splurge for a pretty soap container and a beautiful jar for the shelf. Yes, they are a little more expensive, but you only have to buy them once and you can refill them with soap over and over again. These small beautiful details can make a huge difference. Keep décor consistent. Big contrasts in décor is too much for a small space. Keep contrasts low in a small bathroom décor by using a simple pop of a single color. 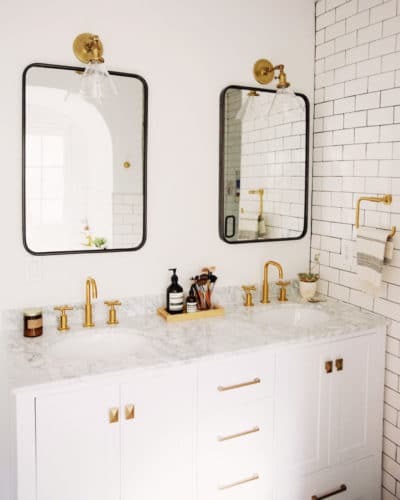 Whether you have a tiny space, lack of storage, outdated furnishings, drab colors or dingy looks, these simple tricks help solve all the most common bathroom problems. Give your space a makeover and fall in love with the loo.